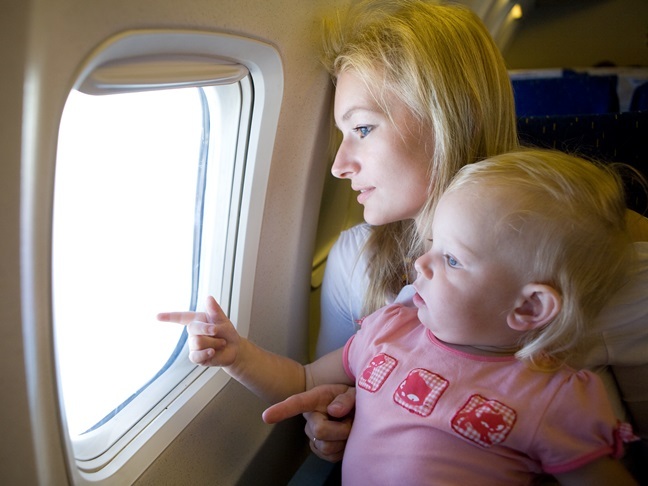 It’s one of the most-feared challenges as a parent: a long flight with small children. Will they nap? Will they scream? Will we be “that family” bothering all the other passengers? We live outside of Washington, D.C., and one set of grandparents is in Denver; the other is in Portland, Ore. My 2 ½ year old daughter has crisscrossed the country more than a dozen times. Lollipops. A child is very quiet with a lollipop in her mouth, plus it can take about an hour to eat. Are you hearing this? AN HOUR OF QUIET. Screens. I let her look at pictures on my phone and watch “Sesame Street” and “Caillou” on my computer for as long as she wants. Toys. I bring something new for her to play with on board. One time, a play purse kept her happy from Oregon to South Dakota. Garbage. Nothing occupies my infant quite like a plastic cup that she can squeeze and crunch. Order water rather than soda or juice so her hands don’t get sticky from the empty cup. Forbidden snacks. Do you only give your child processed foods like Goldfish or Oreos on special occasions? Guess what? This is a special occasion. One more thing: make sure to ask the flight attendant which restroom has a changing table right when you get on the plane. There's often only one, and you don't want to be walking up and down the aisle with a crying baby trying to find it.